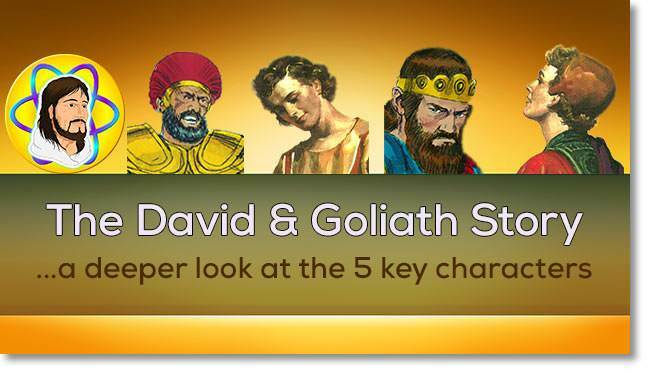 We have been looking at the philosophy of three different characters in the story of David & Goliath. Each one is thinking differently in their heart. We could ask, "Which one is a picture of you and how you live your life?" I guess when I look at these characters I can see myself in all three, at different stages of my life. Praise God there is a life on a higher plane than Goliath and Saul lived! The fifth person (including God) who was there when David slew Goliath was Saul's son Jonathan. 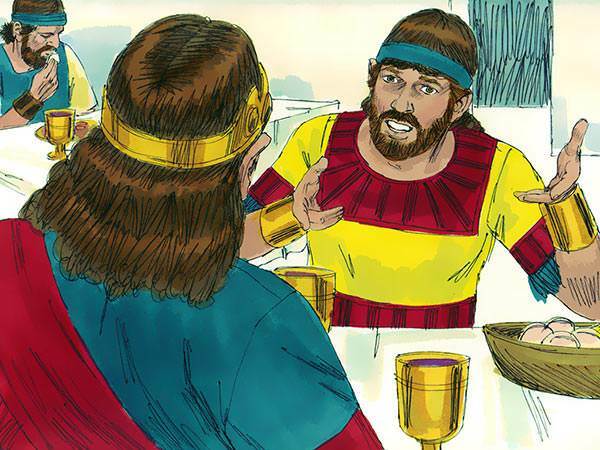 If you know the story, David became a national hero after he slew Goliath and he was invited to the "White House" of his day, to appear before King Saul. It was here he met Jonathan. Usually, when someone became a hero and came to the palace, many would gather around to hear how the task was accomplished. I'm sure this wasn't the first time that Jonathan was at one of these events. The hero would tell how he did it with great gusto, making sure everyone was impressed. What was different this time was that this fellow was very humble about what had been accomplished and instead of seeking to impress others as to how he did it, David was giving the glory to God. Jonathan had grown up in a similar situation as that which David had experienced. 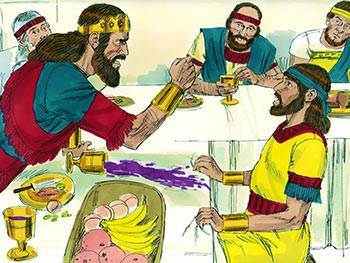 David had to learn to live with his brothers while Jonathan had to learn to live with his father. In each case, their problems were bigger than they were and they came to put their faith and trust in God. In a matter of minutes Jonathan felt a kindred spirit with David, and they became the best of friends. When these two gave their lives over to God, He filled them with His Spirit. Self took a back seat to seeking to live for God. Jonathan's idea of David becoming king instead of himself almost seems unreal. 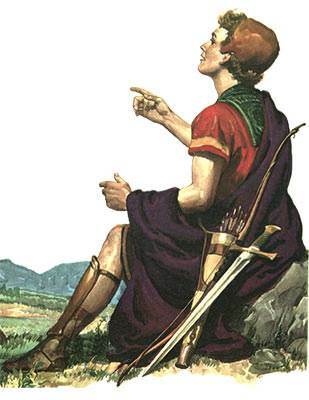 It certainly would have been to Goliath and it certainly was to Jonathan's father, King Saul. Living to help others fulfill God's purposes for them became Jonathan's driving force. 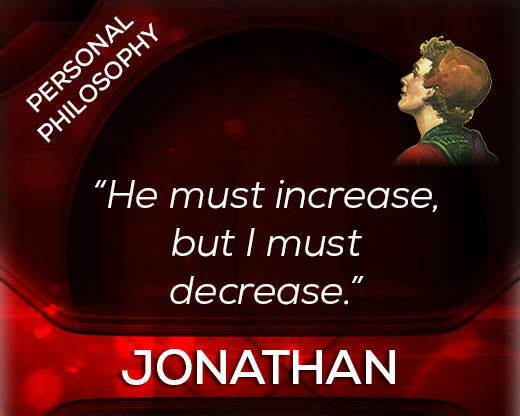 "He must increase and I must decrease" is a strange philosophy to the average person in the world. It takes a great deal of dying to self, which is something that even many Christians seem to have a hard time comprehending these days. This is why there is such division in the Body of Christ where there should be unity. 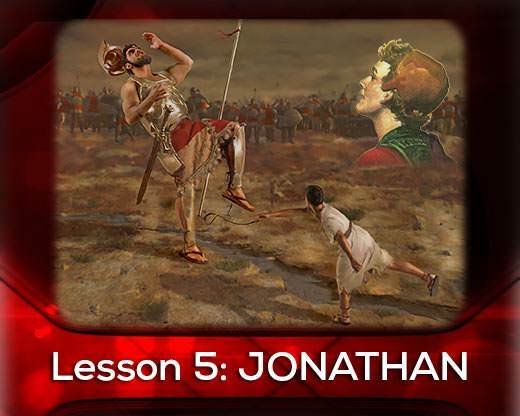 Jonathan's major task after he met David and decided to seek to advance him, was to protect him from his father. He knew that his father was only interested in his own kingdom and although at times the king acted like he was interested in David, his real interest was how he could use him. What a wicked heart Saul had! I wish there weren't any 'Sauls' living today but—sad to say—there are all too many. You can usually pick them out by discerning whether they are interested in the cause of the King of kings or just their own little world. The unfortunate thing is that these people are often dressed in sheep's clothing when they are actually wolves. It seems that the number one objective today is to look out for yourself. Put yourself in control, get it for yourself, keep it for yourself, and do it for yourself are values which are constantly being fostered. Love, joy, and peace are hard to come by in this environment. Most of us know all too well the unhappiness that selfishness brings, especially if we are on the receiving end of it. Jonathan apparently had enough of this and wanted to live in a climate that was different. Often it takes being on the short end of selfishness for us to see how ugly it is. When we gain a clear picture of it in others, then the Lord gives us an opportunity to see what it is like in us. Apparently Jonathan had gone down this pathway not only seeing it in others but also seeing it in himself. He decided that this wasn't the way to live and came to the place of asking God to show him each time he was selfish, so that he could confess it and make things right. Inwardly God caused him to become love-full, joy-full and peace-full. Towards others he came to be longsuffering, full of gentleness and goodness. People began to notice his faith, meekness and self control. He gave the praise and glory to God. 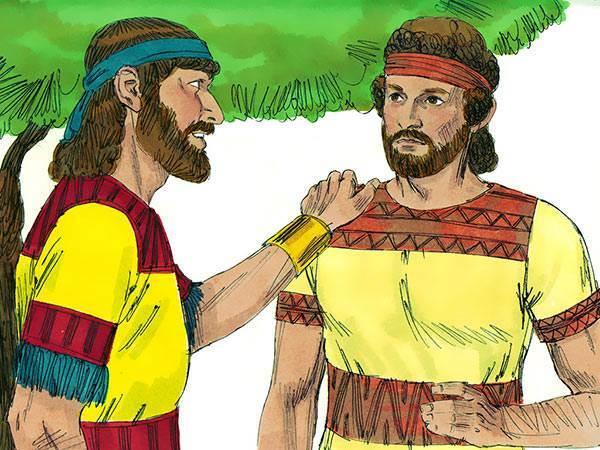 Jonathan was amazed at the joy he was getting by seeking to advance David. It was not until he got actively involved that he discovered this. Those who watched from the sidelines could not figure it out. It seemed foolish for him to try and explain it, until God revealed it to them like He had to him. Most of us can understand why Goliath died and why, when Saul was so disobedient, he died. But why did Jonathan die so young? One could give all kinds of reasons why he should have lived. Some things are not told us down here and we will have to wait until we meet the One who decides these things to find out for sure. I like to think that he died so that someone else would play that role. Let me explain what I mean. Do you know who first told me the story of David & Goliath that I have been telling you about in these pages? It was my twin brother Con. After he told the story to me and before he wrote it down he had a tumour of the bowel and then a tumour of the brain and died when he was just 38 years old. He knew before I did about Goliath and who he was a picture of—namely old king Self. Con was my Jonathan. "You keep asking that question and now I will tell you the answer. He wanted you to be like David and now I want you to be like Jonathan. Go find another David and tell him to kill the giant in the power of the Spirit of God." Ever since that time I have been motivated to do just that. Why did Jonathan die? Probably he finished the work that God wanted him to do and God took him home to his reward. 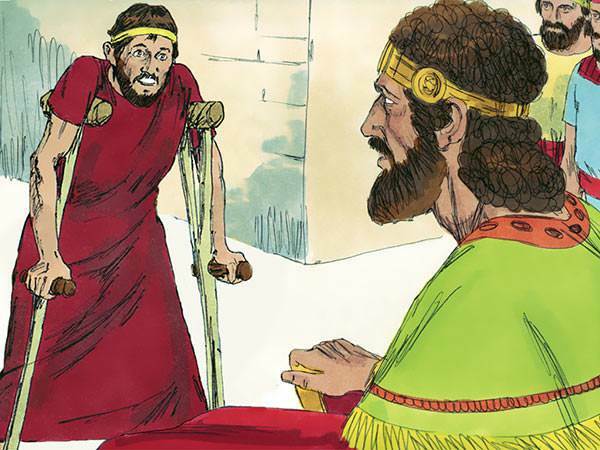 Do you remember how David went and found the crippled boy who was Jonathan's son and had him live in the palace with him (2 Samuel 9)? Would it seem foolish for you to do this? Think about this: it wasn't hard for David once he pondered all the things that had been done for him by Jonathan. Each one of us owes a lot to many people if we would just pause to consider it. The problem is that many of them are dead now, or at least not around, so we will have to find someone else to whom we can show kindness. Who are you? No doubt as you have studied this series the Spirit of God has talked to you about who you are like. You may even be a pastor, a Christian leader, or have one of a hundred different titles or positions. Has it been His Kingdom or your Kingdom that you have been building? You have come to see SELF. Probably at first in others, but now in yourself. "God loves Little People", so we all need to humble ourselves and ask God for forgiveness.I believe that God wants to have a "Little Peoples Revival". God wants His people to humble themselves and become one, and then win and disciple other Little People for God. Information is one thing—Action is another.